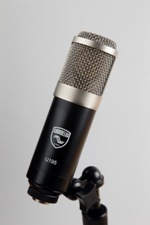 Overview: Affordable price point / top quality microphones, hand made in the USA. David Bock, founder and president since 2007 is a long-time studio tech by trade who was the chief tech at Ocean Way, Hyde Street and Hit Factory during the heyday of the 80s and 90s. His work included maintaining and repairing a massive collection of vintage studio microphones, used daily for client's recordings. Understanding how a vintage microphone works and why it sounds that way is the key to David's precision in pro audio, engineering ability, and studio perspective. Soundelux and Bock Audio are both owned and managed by David. Large diaphragm condenser (solid state) Cardioid microphone. Our opinion: A true all rounder large diaphragm FET mic. If you don't need more than the popular Cardioid pattern, the U195 will shine on pretty much anything as it has a typical LDC voicing but without any harshness, mud or midrange honk. Unusual wide bandwidth and low noise for a transformer based design. The FAT mode gives the impression of having more proximity effect than a typical Cardioid condenser, not much different from the low end boost of a ribbon mic used up close. 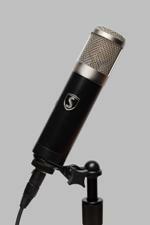 The SOUNDELUX USA U195 is a custom built, hand made, cardioid pattern phantom powered large diaphragm FET microphone. In designing the U195, David Bock set out to create an extreme value in studio mics that could satisfy a wide range of demands for highly experienced engineers that own many more expensive microphones, yet need additional mics within a budget. It delivers superb results on lead vocal tracks as well as in instrument and guitar amp use, providing remarkable fullness and presence with exceptionally low background noise for a transformer output design. All versions: Single FET modified U87 circuit. Cardioid only mic with k67 copy capsule. The original Soundelux U195 model was produced 1997-2006. Later U195 models were sold under the Bock Audio brand (Chrome head basket). During the first few years a Reichenbach 10:1 xfmr was used, later a Cinemag, then later the ratio changed to 8.5:1 which resulted in a gain improvement without loss of bandwidth. Latest (current) version re-introduced under the Soundelux brand in 2016, with a new and improved capsule and Cinemag output transformer and a nickel finish head basket. 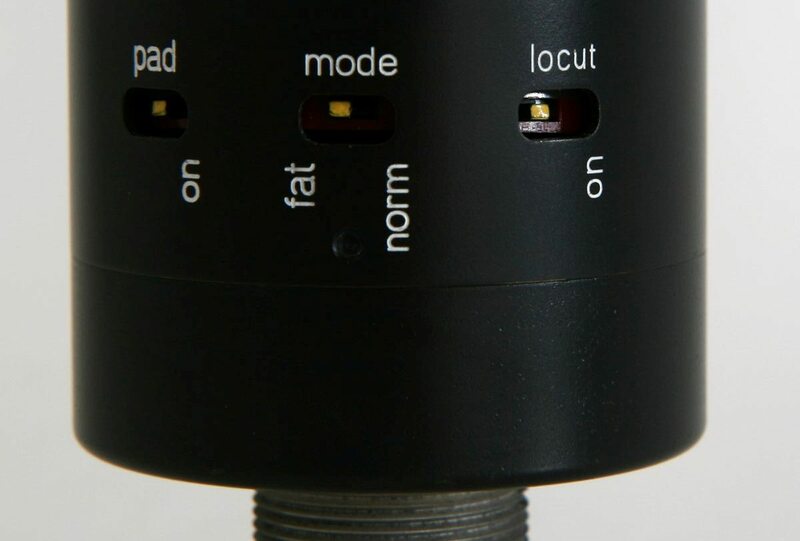 "fat/norm" bass contour switch: The Mode switch offers two modes of operation, FAT and NORM. FAT is a low end boost between 10Hz and 400Hz for that distinctive sound of older tube classic cardioid condensers. NORM is extended flat response with slightly elevated high end typical of FET condensers. The switch manipulates the negative feedback built into the circuit; in FAT mode, mid-to-low frequency negative feedback is reduced. "locut": rumble filter switch: -10dB@30Hz relative to 100Hz. "pad": -10dB (non-capacitive pad; it works by changing the polarization voltage of the capsule). Frequency Range: 20Hz to 16kHz, +/-2dB. Sensitivity: 8mv/Pa (-42dBm @ 94dB SPL). Equivalent Noise: 12dB (“A” weighted) 23dB (unweighted). Impedance: 200 Ohms true transformer balanced. Output connector: 3 pin XLR, Pin 2 hot. Dynamic range (max SPL - "A"noise): 111dB. S/N (94dB-noise): 82dB “A”, 71dB unweighted. Capsule size: 1” diameter, dual symmetrical backplate K67 type. Power consumption: 0.5mA @ 48Vdc. Amplifier type: Minimalist Class A fet/transformer, no switching supplies or oscilators. Dimensions: 2” dia x 7.7” L. (50x195mm). Weight: 1lb 9.6oz (1.6lbs) = 725g. Power Supply: user provided Phantom Power @ 48V per DIN 45 596/IEC268-15A. Please note that a minimum of 48V is strongly recommended. Supplied in its padded cardboard box with a swivel mount (see photo). Price: 929€ Exc. VAT / 1124,09€ Inc. VAT. Large diaphragm condenser (tube) multipattern microphone. NOTE: The U99 is sold with a basket shockmount (below with the other included accessories) - not the swivel mount shown above. Our opinion: With an obvious hand made vibe, this is a modern take on the classic large diaphragm tube mic concept. Showing a typically "German" LDC voicing without the often associated slightly hard high midrange or low mids mud. Compared to a vintgae tube mic is has increased bandwidth and an appreciably low noise for a tube, transformer output design. The various voicings will give many different personalities to the system making it surprisingly versatile - a bit of EQ and you could use pretty much use it as your only LDC for all overdubs. You can indeed get pretty close to the old U67 using the onboard EQ cut control. Inspired by the original “Sound of Tomorrow U67”, the Soundelux USA U99 is a multi-pattern tube microphone (continuously variable pattern from PSU) for the recording studio and for premier live events. Featuring a k67 dual symmetrical backplate dual membrane capsule along with the signature Soundelux USA “fat” switch featured on the U195 microphone, and an innovative new high frequency “boost-flat- cut” switch, the U99 has enough proximity effect to sound full, but not so much that it sounds boomy. This makes it a natural on vocals, acoustic instruments, drums, and VO. As with all Soundelux USA tube mics, The U99 uses a “new old stock” tube and true linear high current power supply for fullest possible sound. It also features a large core BV8 output transformer to radically increase the low frequency headroom. The mic comes with it's own proprietary linear N470 power supply, six pin XLR cable, and bottom thread shock mount, and is built in the same facility by the same people who build Bock microphones. Originally produced U99: 1999-2006. Multi-pattern, first 100 or so units had Russian EF86, Latvian (BLUE) k67 capsule, and Reichenbach, later Cinemag transformer. A revised version called the U99b used NOS PF86 tubes, about 50 units produced. The mic then went to a NOS EF732 and German k67 capsule and went back to being called the U99. The last version of that U99 had a high frequency cut switch, and used the P-99 PSU, all USA made. The current version has the new K67 type capsule used in the U195, the Fat switch made popular in the U195, HF contour switch and the new N470 power supply. wide shelving response, +/- 1dB range boost. HF cut frequency switchable via the "Hi-Lo" switch (side of the mic). K67 type dual backplate dual diaphragm capsule. Polar Pattern: sweep from Omnidirectional to Figure-8, cardioid position at 12:00. Frequency Response: 30Hz-16kHz (±2dB) in Flat mode. Signal to Noise Ratio: 81dB (A weighted). Equivalent (self) Noise: 13dB (A weighted). Power Source: Bock N470 True Linear power supply included. Features: NOS EF732 sub-mini pentode tube. Dimensions: 2.04 “diam. 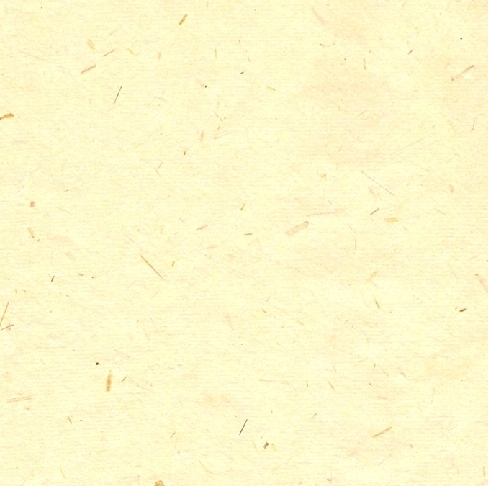 x 8” l. (51x203mm). Weight: 1lb 8.8oz (1.55lbs) = 703g. Supplied with all relevant accessories (cf. overview). Price: 1859€ Exc. VAT / 2249,39€ Inc. VAT.